I was recently swatching for a new design and I was truly practicing what I teach. I thought I’d take a second to talk about the most commonly asked questions I get, how (and why) to block a gauge swatch. 1) It was going to be a tank top with i-cord straps, so I knew that the weight of the whole garment would be hanging off some very small anchor points. 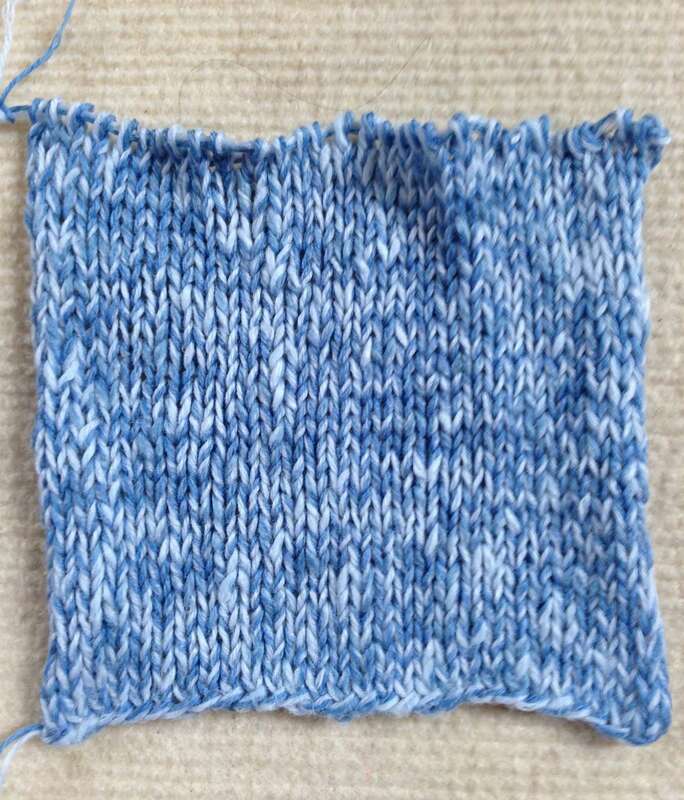 2) This yarn was going to change a LOT with blocking. So the first thing I did was make a mini swatch to see how the look of the fabric was going to change. You see, when I swatch I focus on getting the fabric I want. Since I knew the look of this fabric would change significantly, I made a little 3″ x 3″ swatch, and then blocked it. This way I could see if the needle size I was using was going to give me the look I liked. 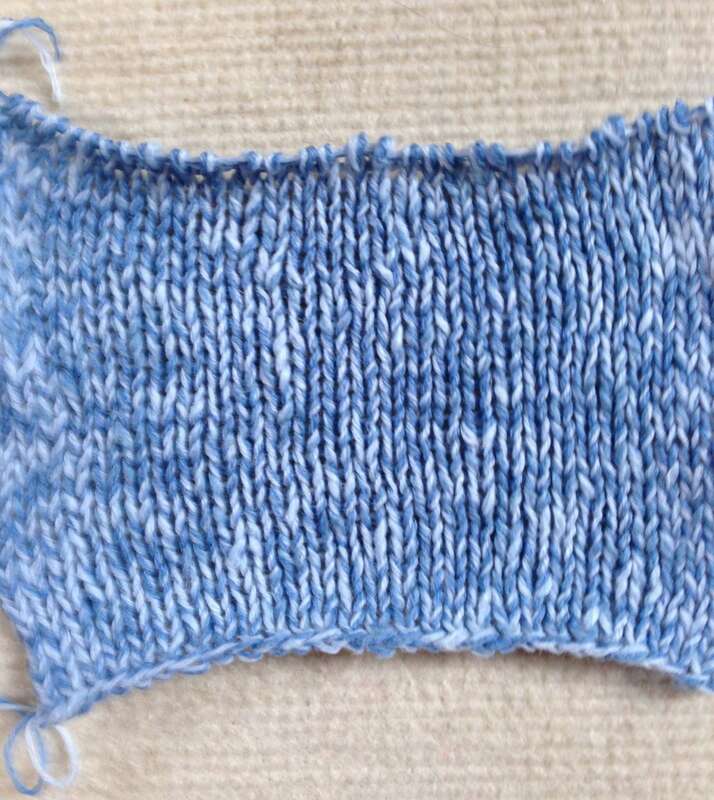 Here you can see the difference between the unblocked (larger) swatch, with it’s skimpy looking, uneven stitches, versus the fluffy, nice, fat and juicy blocked stitches. The mini swatch told me that the US 6 was a go, so I made my larger swatch. Large unblocked swatch, and mini blocked swatch. I measure my unblocked gauge, so I know not to freak out while I’m knitting. 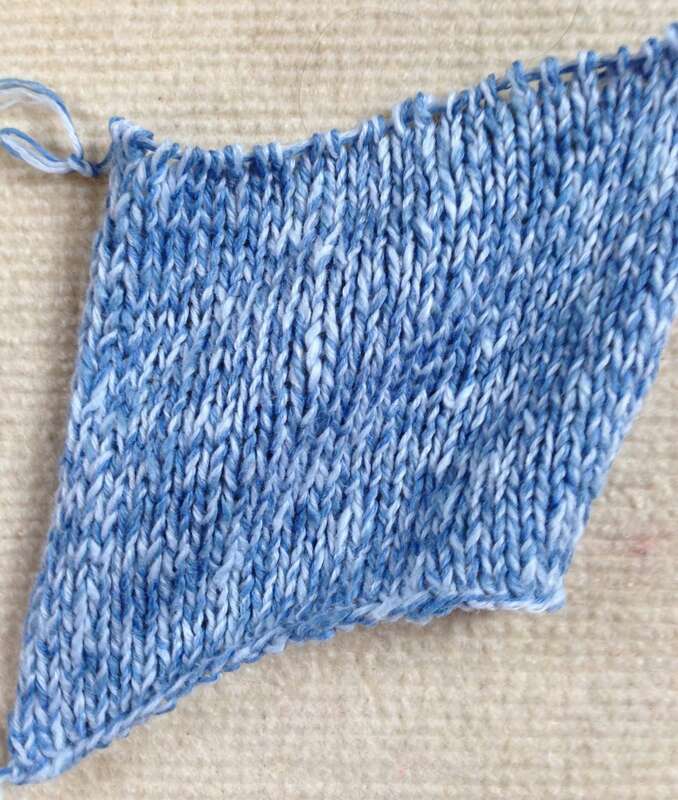 I always tell my students that you knit to your unblocked gauge, but you design to your blocked gauge. If I know what my unblocked gauge is, I will be able to make sure I’m staying on track as I knit, and I also won’t worry if my piece is seeming the wrong size as I work. You’ll notice how wildly uneven the row gauge is for the unblocked swatch. This is caused by the fact that I’m doubling a very nubby, thick thin, no elasticity fiber. Unblocked swatch. Ruler showing level. Top shows the huge variance in row gauge. Lay swatch out to dry. Notice how the row gauge is now even on both sides. The larger, greedy stitches have shared with the stingier smaller ones. The rows loosened up with moisture to allow the tight rows to relax. It’s like taking your swatch to the spa. Once it’s totally dry, measure it again. Row gauge is now evened out. Finally, I suspect this fiber is a “grower”, so last step – hung gauge. After the swatch is fully dry (this is really important with a cotton – FULLY dry), I need to simulate gravity. I clip the swatch onto a pants hanger and hang some heavy earrings on it to see if it stretches. Let it hang overnight, remove the weights and let the swatch rest. Final step is to measure your hung gauge. If the fiber you’re working with has elasticity AND memory, the swatch might stretch, but it might return to it’s pre-hung gauge after a nice rest. If your fiber has elasticity and NO memory, the swatch might stretch and not return. Do you have to hang every swatch? No, just the fibers you suspect might grow. Since the taller a stitch gets the narrower it gets, you will have to remeasure both stitch and row gauge. If you think the numbers aren’t “that different”, and that was a whole lot of work for nothing, consider this . . . the difference between the unblocked gauge and the final hung gauge is a 32″ chest vs 34″ chest. It also means the difference between your tank top growing until it’s obscene v.s. fitting you perfectly. As a designer this means since I know the fiber will stretch, the pattern will be written primarily with row instructions and not “work until piece measures”. It didn’t take that long, and you’ll get a garment that fits you perfectly!